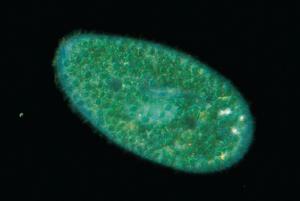 Paramecium bursaria is a ciliate that contains mutualistic algae called Zoochlorella. The algae lives in the cytoplasma of the Paramecium and provides it with food. Paramecium bursaria grows in Dilute Alfalfa Medium (Hay Medium) or Soil Water Medium. Requires light for growth.